The presentation ceremony at Biggar. On the left is the Lord Provost of Glasgow, Patrick Dollan and third from the right the Field Bishop of the Polish Forces. On the 31st August 1940, the Regimental Day of the 9th Lancers, in the town of Biggar new colours from the citizens of Glasgow were presented by the Lord Provost of Glasgow, (left in photo) Patrick Dollan to the Polish Army. Present at the ceremony were General Sikorski, PM and C-in-C of Polish Forces and President Raczkiewicz. The Regiment saw this presentation as an act of Scottish-Polish friendship and particularly an act of friendship between the Citizens of Glasgow and the Regiment. The students of the Needle-Work Department of the School of Art contributed to the making of the standard. The design featured a Polish Eagle and the Glasgow Coat of Arms. The old Colours of the Regiment had been destroyed in Warsaw in 1939. The 9th Malopolski Lancers were formed in 1809 and later re-formed in November 1918 when Poland won back her independence. The Regiment disbanded at the end of 1947. In 1947, the standard was laid up in the Polish Institute and General Sikorski Museum in London. The traditions of the 9th Lancers were maintained by the 1st Recce Unit of the 1st Rifle Brigade. In 1944, a new 9th Lancers Regiment was formed. The regiment was later included in the composition of the 4th Infantry Division as its recce regiment. On 11th November 1948, the Polish National Day of regaining of Independence, awarded their Honorary Regimental Cross to the City of Glasgow and this was received by Lord Provost McNeill. 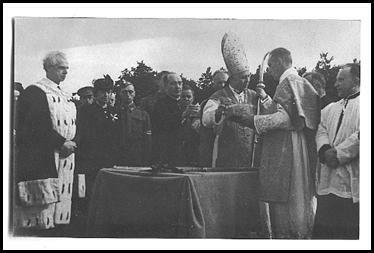 Photographs of the presentation of new Colours in August 1940 may be seen at General Sikorski's Memorial House in Glasgow - The Polish Social and Educational Society in 5 Parkgrove Terrace.